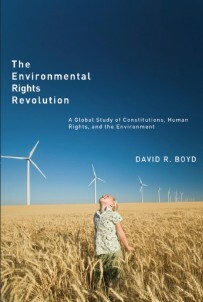 In response to the debate over whether rights to clean air, water, and soil should be entrenched in law, The Environmental Rights Revolution: A Global Study of Constitutions, Human Rights, and the Environment by David Boyd, (2011, UBC Press) moves beyond theoretical debate to measure the practical effects of constitutionally enshrining the right to a healthy environment. Analysing 193 constitutions and legal decisions taken in over 100 nations in Europe, Latin America, Asia, and Africa, Boyd demonstrates a positive correlation between constitutional protection and stronger environmental laws, smaller ecological footprints, superior environmental performance, and improved quality of life. Boyd’s analysis is timely, especially for environmental justice organisations (EJOs) engaged in legal disputes for the protection of resources and livelihoods. A salient example of the impact of constitutional recognition of environmental rights comes from the current dispute between Taseko Mines Ltd. and the Tsilhqot’in First Nation people of British Columbia, Canada. Last year, the Canadian Environmental Assessment Board rejected the mining company’s proposal for the development of one of the largest copper and gold sites in the world, with an estimated ore body value of greater than $20 billion (CAD), on the basis that it would damage the culture, well-being and traditional practices of the Tsilhqot’in. More recently, a Supreme Court judge granted an injunction to stop further exploration at the site as the company sought to develop a revised proposal with a smaller footprint. Declaring “The ore bed is not going anywhere,” Justice Christopher Grauer said exploration, drilling and road building could affect the environment and the rights of local Indigenous groups, ruling that they weren’t properly consulted on two permits granted to Taseko by the provincial government in accordance with the Province’s Constitutional duties. Grauer also said the First Nation will suffer greater harm than Taseko if it carries on its work for the proposed “New Prosperity” mine. The 90 day injunction was granted in order to seek a judicial review of the exploration permits issued, demonstrating the truth of Boyd’s assessment of the positive correlation between constitutional protection and improved quality of life. In this case, the enshrinement of the constitutional rights of the Tsilhqot’in, a small and isolated Indigenous group, means that a sacred fishing lake and local hunting area remain protected from the threat posed by a 10,000-person mining camp and all its attendant social impacts, at least for the time being.